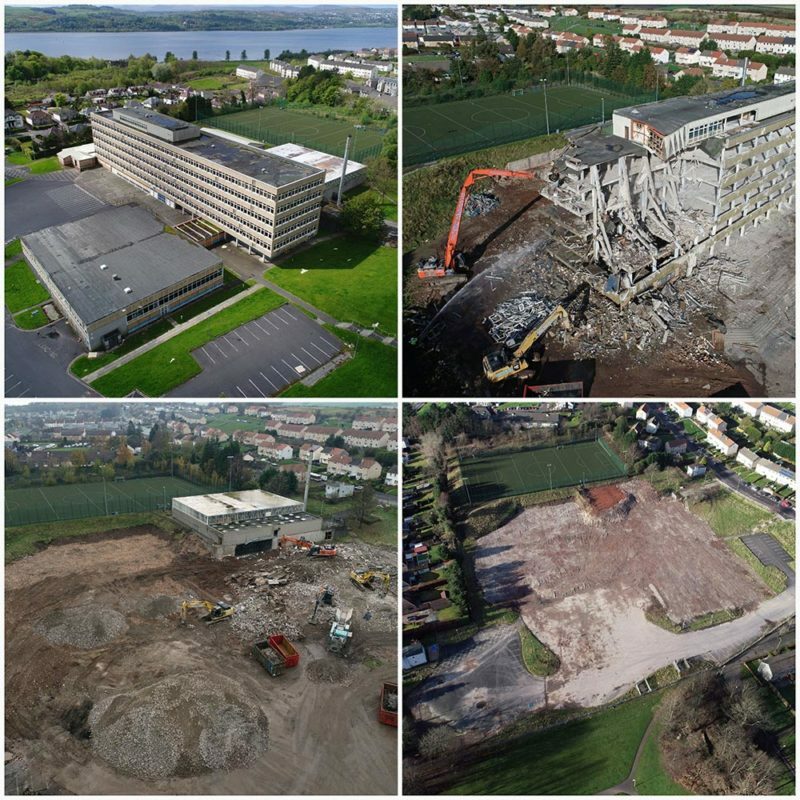 Central Demolition Ltd were awarded the contract for the demolition and licensed asbestos removal works of Our Lady & St Patricks High School. We completed the contract on 22nd January 2019. 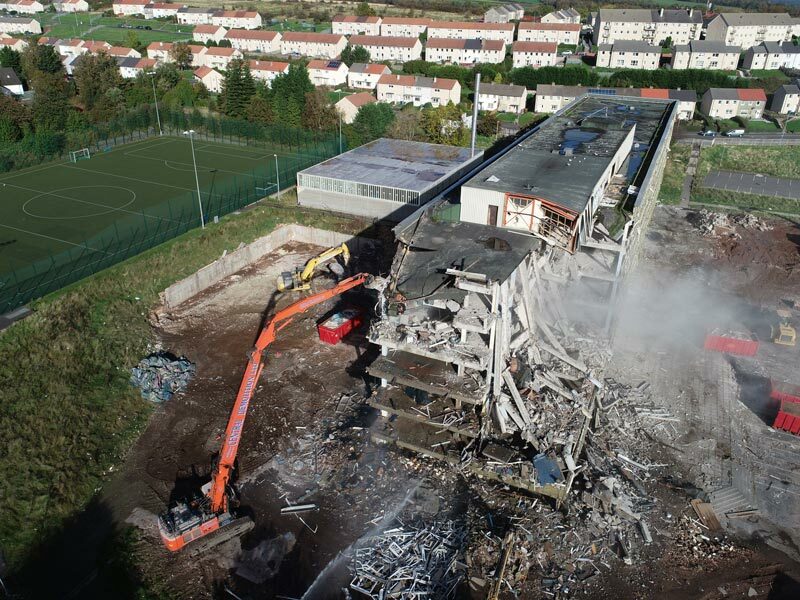 The demolition project that we were undertaking on behalf of West Dunbartonshire Council consisted of both high and low rise concrete structures. The main school building was6 storeys high and the surrounding ancillary buildings were also to be demolished. 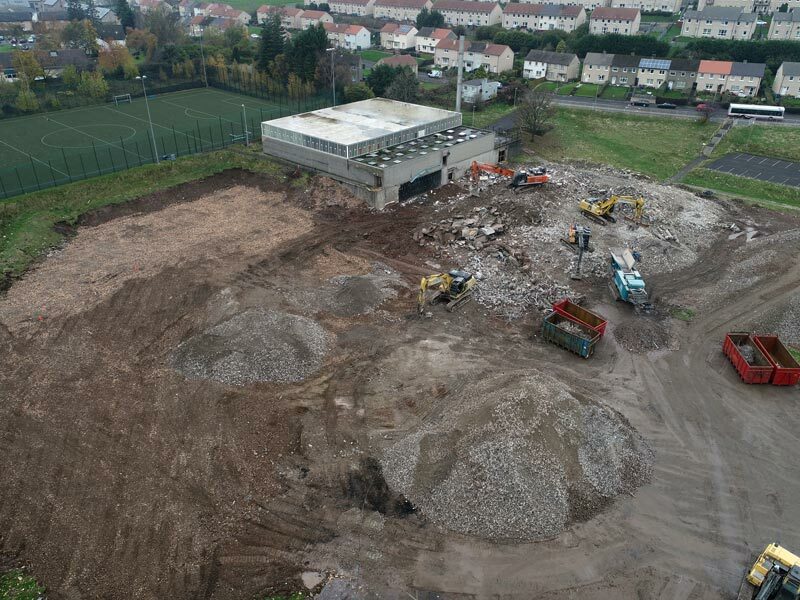 The project firstly required some preparatory works which included extensive soft stripping of the main school building as a number of items had been left in the building. These items were then placed into skips and taken back to our recycling plant for further segregation and processing. Once all materials and items had been removed from each floor, the asbestos removal phase of the works began. We removed licensed & non licensed asbestos from the premises which were mainly located in the pipe ducts on each floor and the assembly/dining area of the school. The asbestos removal phase of the project took approx. 12 weeks to complete and our fully licensed team were working in tandem with our demolition team as we moved from the top floors of the building down to ground level. 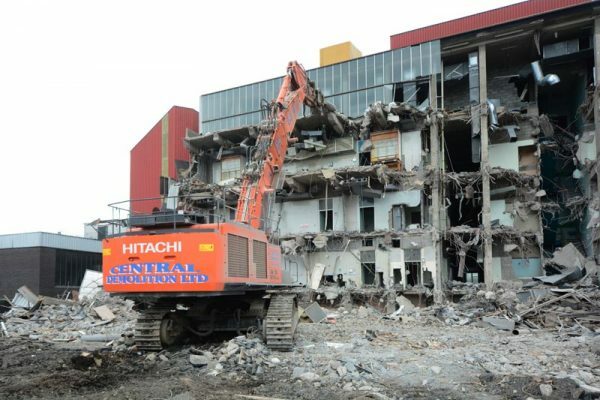 The Demolition phase of the project was carried out by machine demolition required us to utilise our Hitachi ZX470 26 meter reach excavator as main school building topped at 6 storeys. We also utilized smaller CAT excavators on site to load skips and crush concrete at the lower levels. We crushed all arisings to 6F2 grade, with which we back filled the site and levelled on completion. The main challenge within this contract was the fact that there was a live substation on site that was still due to be disconnected when our works commenced, this extended our programme time as the situation had to be assessed by our client and Scottish Power before the later allowed a competent person from Central Demolition to expose the high voltage cables to be cut. However, our methodology and programme of works were modified to accommodate this and the demolition was completed to the client expectations. This added a risk to the project but this was properly managed by using a competently qualified person to dig round the cables and liaising with the stakeholders accordingly, however our programme time had to be modified slightly to accommodate this delay to our works on site. 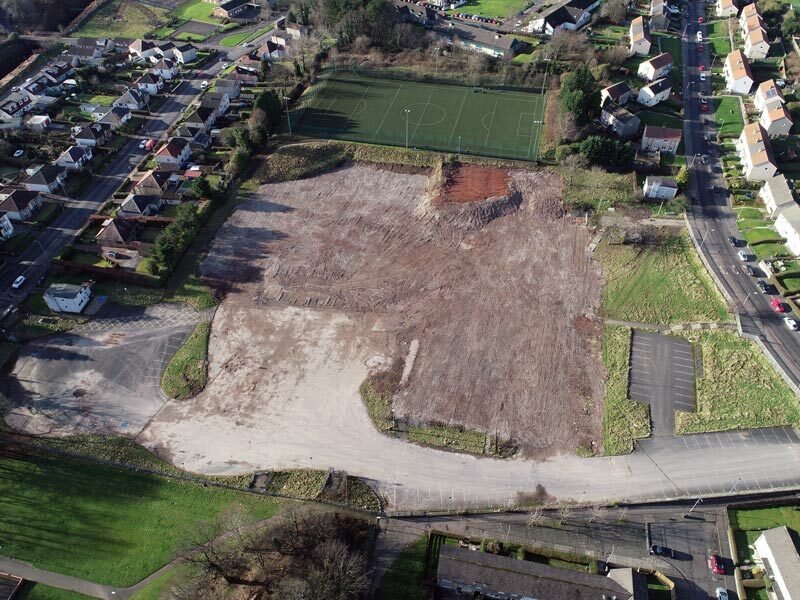 Another risk to the project was the fact that the former school was located in the middle of a housing estate but we managed any risk to the public by notifying them of the works ahead of commencement on site, adhering to a strict site traffic management plan and using our approved security contractor to manage the site boundaries during non-working hours.